David and I have been offering this greatest-of-90-years-ago series almost as long as this blog has existed. For earlier annual entries, see 1917, 1918, 1919, 1920, 1921, 1922, 1923, 1924, and 1925. I approached 1926 with the assumption that it would present a crowded field of masterpieces; surely it would be difficult to choose ten best films. Instead it turned out that some of the greatest directors of the era somehow managed to skip this year or turn in lesser films. 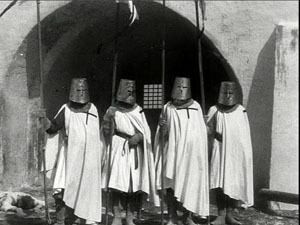 Eisenstein had two masterpieces in 1925 but no film in 1926. 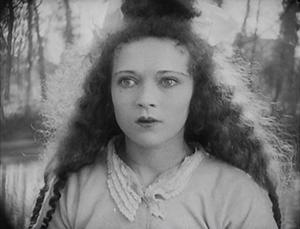 Dreyer made a film that is a candidate for his least interesting silent feature, The Bride of Gromdal. Chaplin did not release a film, and Keaton’s Battling Butler, while a charming comedy, is not a plausible ten-best entry. 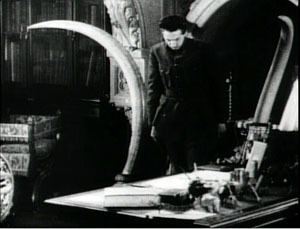 The production of Lang’s Metropolis went over schedule, and it will appear on next year’s list, for certain. Still, the Soviet directors were going full-tilt by this time and contribute three of the ten films on this year’s list. 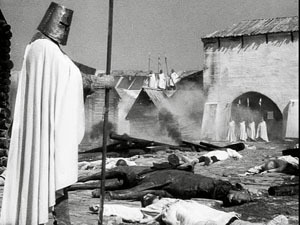 French directors on the margins of filmmaking created two avant-garde masterpieces. Two comic geniuses of Hollywood already represented on past lists made wonderful films in 1926. A female German animator made her most famous work early in a long career. I was pleased to reevaluate a German classic thanks to a sparkling new print. Finally, Japan figures for the first time on our year-end list, thanks to a daring experimental work that still has the power to dazzle. 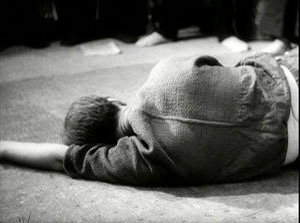 Vsevolod Pudovkin’s Mother was a full-fledged contribution to the new Montage movement in the Soviet Union. By the 1930s, that movement would be criticized for being too “formalist,” too complex and obscure for peasants and workers to understand. 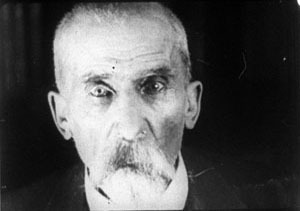 Nevertheless, being based upon a revered 1906 novel of the same name by Maksim Gorky, Mother was among the most officially lauded of all Montage films. It tells the story of a young man who is gradually drawn into the Russian revolutionary movement of 1905. His mother, the protagonist of the novel, initially resists his participation but eventually herself joins the rebellion. 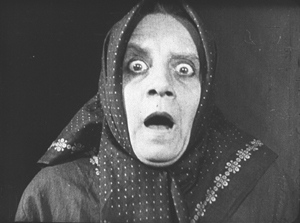 Along with Potemkin, Mother was one of the key founding films of the Montage movement. Its daring style is no less impressive now than it must have been at the time. One brief scene demonstrates why. 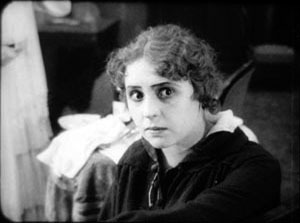 Fifteen years before Mother, D. W. Griffith was experimenting in films like Enoch Arden (1911) with cutting between two characters widely separated in space, hinting that they were thinking of each other. 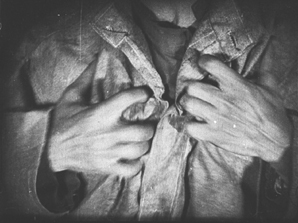 By 1926, Pudovkin could suggest thoughts through editing that challenged the viewer with a flurry of quick mental impressions. As the Mother sits beside her husband’s dead body, her son, a participant in the 1905 failed revolution, comes in. He is about to bend down and open a trap-door in the floor (73 frames). A cut-in shows her horrified reaction (12 frames), and there follows a brief close shot of some guns she had seen him hide under the floor in an earlier scene (11 frames). 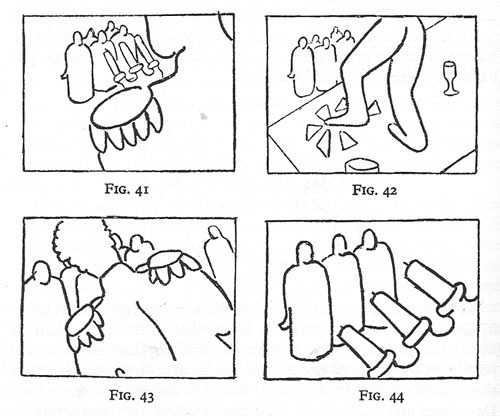 Even shorter views of a man clutching his chest (8 frames), two jump-cut views of the dead husband (3 frames and 2 frames), and a tight framing of the son being shot follow (8 frames). We return to her face, registering even greater horror (15 frames). A return to the initial long shot shows her leaping up to try and stop her son from taking the guns out to participate in a seditious act (31 frames). 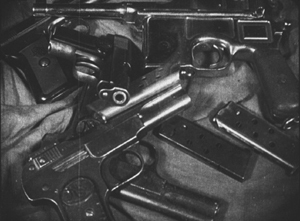 The series of five shots goes by in a few seconds, and we are challenged to grasp that the guns are a real memory, while the shots of the man’s chest and her son’s anguished face are visions of what might happen. The shots of her husband’s body suggest that she could soon end up sitting by her son’s corpse as well. The jumble of recollection, imagination, and reality are remarkably bold for this relatively early era. 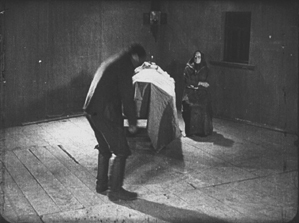 Mother also contains two of Pudovkin’s most memorable scenes, the breaking up of ice in the spring as a symbol of the Revolution and the final violent attack on the demonstrators, including the heroine. Mother was released on DVD by Image Entertainment in 1999, but it seems to be very rare. An Asian disc, perhaps a pirated edition of the Image version, is sold on eBay. I’ve never seen the film on DVD and can’t opine on these. The time is ripe for a new edition. 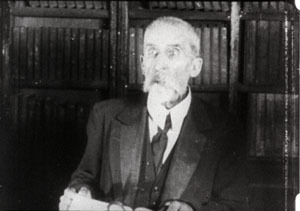 Pudovkin was one of the filmmakers who had studied with Lev Kuleshov during the early 1920s, when Kuleshov made the famous experiments that bear his name. 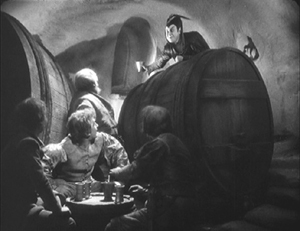 Pudovkin played the head of the gang of thieves in The Adventures of Mr. West in the Land of the Bolsheviks, which I included in the ten-best list of 1924. Kuleshov had moved on as well to direct his most famous film and probably his best silent, By the Law, based on Jack London’s story “The Unexpected.” Set in the Yukon during the gold rush, it involves five people who are cooperatively working a small claim and discover gold. Taking advantage of a warm autumn, they stay too long and are trapped for the winter. 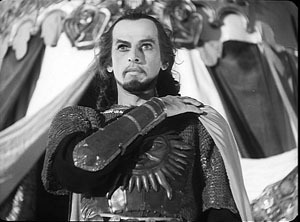 One of the men kills two of the others, and the heroine, Edith and her husband Hans are left to determine the fate of the killer, Dennin. Edith insists on treating him strictly according to the law. After enduring the harsh winter and a spring flood, the couple finally act as judge, jury, witnesses, and, after finding Dennin guilty, executioners. The great literary critic and theorist Viktor Shklovsky (one of the key figures of the Russian Formalist school) adapted the short story, condensing it by eliminating the opening section of Edith’s backstory and a few scenes in which a group of Indians appear occasionally to help the prospectors. The result is a concentration on the tense drama of a three people trapped together in a tiny cabin. 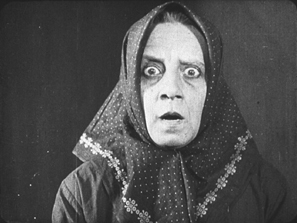 In the 1924 entry, I mentioned that Kuleshov’s team emphasized biomechanical acting and that Alexandra Kokhlova was adept at eccentric acting. She delivers a bravura performance here, as Edith moves closer to a breakdown as the months go by. Kuleshov also puts into practice the experiments in imaginary geography that his classes had made. 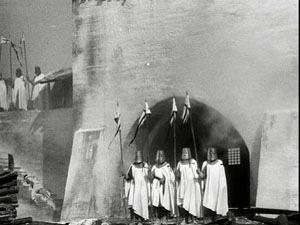 Although in this film he didn’t unite shots made in widely separate spaces, he did favor scenes built up of a considerable number of detail shots before finally revealing the entire space in an establishing shot. 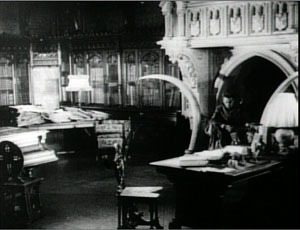 Edith, for example, though glimpsed briefly asleep early on, is introduced in a later scene by a shot of her boots and Bible, followed by a shot of her head as she read the Bible. 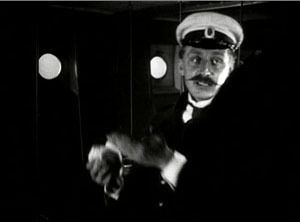 The scene also contains close shots of the other characters before a general view of the cabin interior shows where each of them is. The scene of the execution includes one of the most famous images of the Monage movement, a framing with the horizon line at the bottom edge of the frame and the sky dominated by trees (see bottom). 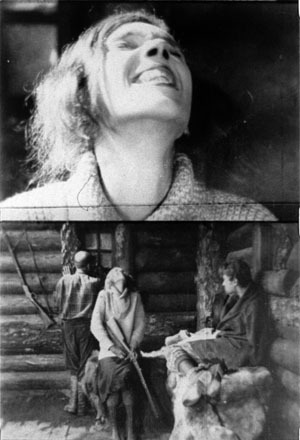 Any number of framings of tall features such as trees and telephone poles against a huge sky appeared in Montage and non-Montage films, and this device became so common as to be a trait of the Soviet cinema of the late 1920s and early 1930s. 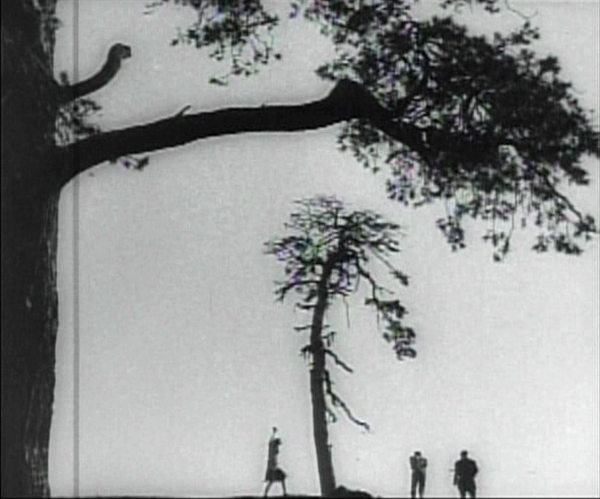 The desire to hide the actual hanging led Kuleshov to stage is behind the larger of the two trees, as Edith and Hans struggle to carry out their sentence on Dennin. This leads to some eccentric framings, such as our view only of Edith’s legs as she teeters on the box where Dennin stands, presumably adjusting the noose (see top of this section). A beautiful print of By the Law is available on DVD from Edition-Filmmuseum. 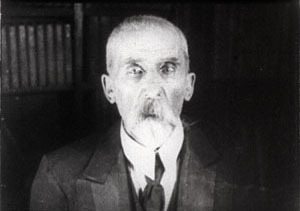 Grigori Kozintzev and co-director Leonid Trauberg did not study with Kuleshov, but they shared a passion for eccentricity. Having started out in the theater, in 1921 both contributed to the “Manifesto for an Eccentric Theater,” a dramatic approach based on popular forms like circus and music-hall. In 1922 they founded the “Factory of the Eccentric Actor” group and two years later transformed it into FEKS, devoted to making films. 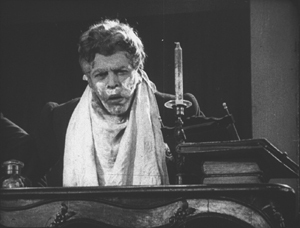 The Overcoat (also known in English as The Coat), their second feature, was based on a combination of two short stories by Gogol, an author whose grotesque creations were very much in tune with their own tastes. It tells the story of a poor, middle-aged low-level government clerk, Akaky Akakievich, who is bullied over his shabbiness, particularly his worn-out overcoat. Scrimping to buy a new one, he finally purchases a magnificent new coat and finds his status suddenly raised–until the coat is stolen. 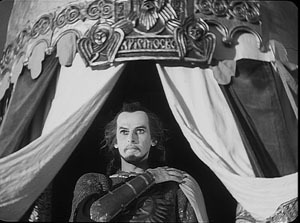 Andrei Kostrichkin was a mere twenty-five years old when he played the fiftyish clerk, but he was highly effective and provided another model of the eccentric actor. 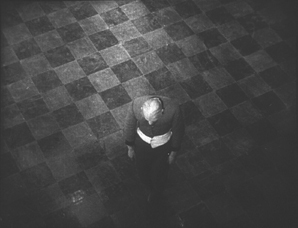 As Akakievich he stands with bent legs and twisted torso, as if flinching away from a blow, and walks in tiny steps along perfectly straight lines through the hallways in his office building. When he applies to a Person of Consequence for help in recovering his stolen coat, the official leans over his desk to look downward, with a high-angle point-of-view framing of Akakievich appearing dwarfed by the other’s superiority. The script of The Overcoat was adapted by another Russian Formalist critic and theorist, Yuri Tynjanov. Unfortunately The Overcoat does not seem to be available on any form of home video. The story itself is simple and indeed might be thought clichéd were it not for two factors. 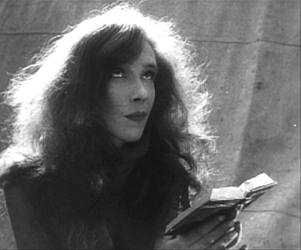 First, there’s the performance of the delicately beautiful Nadia Sibirskaïa as the protagonist. There’s also the lyrical, melancholy use of the settings, initially in the countryside and later in the desolate working-class Parisian district whose name gives the film its title. The simplicity of the narrative also makes it one of the most successful of the attempts to tell a story visually, eschewing intertitles. The film’s most famous scene is its abrupt, shocking opening. With no establishing shot, there is a series of rapid shots of details of faces, hands, a window, and an ax, during which we can barely discern that a man has committed a double murder. The spectator cannot possibly know who these people are and why the murders occur. Instead of offering an explanation, the action then shifts to two little girls playing in the woods. 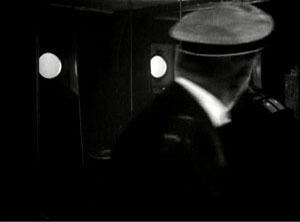 As they return home, the camera begins to concentrate on one of them, apparently the younger, as she arrives at the murder scene and reacts in horror. 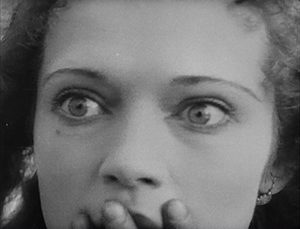 Kirsanoff presents her expression in a series of five shots, linked by what David has termed axial cuts, from medium shot to extreme close-up as she gradually realizes what has happened. There had certainly been axial cuts before this, including in Potemkin, but Kirsanoff probably went further than anyone of the era by including so many shots, by making each so short, and by moving his camera forward in such small increments. It is difficult to notice every cut, particularly the one from the third to the fourth shot, and the effect adds an unsettling quality to an already intense moment. After this opening, a funeral scene reveals through labels on the grave that the murdered man and woman are the children’s parents. We might have suspected that the killer was a jealous husband discovering his wife with her lover. As it is, we never learn whether the crime was the result of a love triangle or the random act of a madman. The rest of the film establishes the sisters now grown up, working in a workshop making artificial flowers and sharing a small flat in Menilmontant. 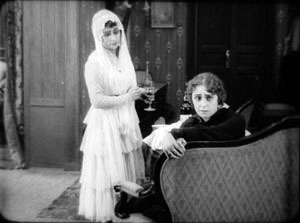 The heroine’s brief romance leads to a baby, and superimpositions and other Impressionist techniques depict her despair and contemplation of suicide. Beautifully melancholy atmospheric shots of the streets of the neighborhood punctuate the action and underscore the dreariness and hopelessness that the heroine faces. The ending, though an improvement in the heroine’s lot, does little to dispel the overall grimness of the story. 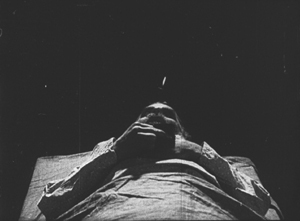 Menilmontant is included in the out-of-print set “Avant-garde – Experimental cinema of the 1920s & 1930s.” It has been posted twice on YouTube in a low-rez format. 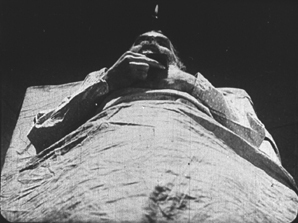 Even shorter is Anémic cinéma, the only venture into film directing by the great French Dadaist, Marcel Duchamp. It’s hard to compare a roughly seven-minute abstract film with narrative features, but this short is so innovative and influential that it’s also hard to leave it off the list. 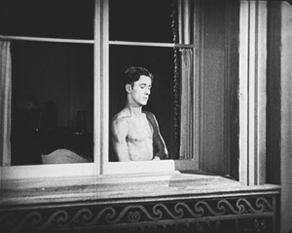 Anémic cinéma is available in the same collection as Menilmontant, linked above. it is also available in the similarly out-of-print set, “Unseen Cinema.” There are numerous versions on YouTube, varying in quality. Some of these have been manipulated by other artists. Though Chaplin and Keaton might have had off-years in 1926, Harold Lloyd did not. Over the past several years, Lloyd has gradually been gaining the admiration he deserves. He used to be known largely for Safety Last (1923) and The Freshman (1925), two excellent films which, however, are not his finest. Girl Shy (1924) and The Kid Brother (1927) are better known now for the masterpieces they are. For Heaven’s Sake (directed by Sam Taylor), which clocks in at a mere 58 minutes, is just as good. 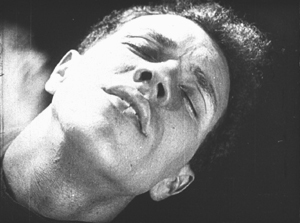 Lloyd plays a breezy millionaire, J. Harold Manners, who unintentionally helps Brother Paul found a mission in the downtown slums of Manhattan. He falls in love with Hope, the missionary’s daughter, and decides to help out around the place. By this time Lloyd was known for his spectacular chase scenes, and there are two here. Initially he puts a twist on the chase, luring a growing crowd of criminals into racing after him, ending in the mission. Gaining their respect, Harold makes the mission a happy social center. 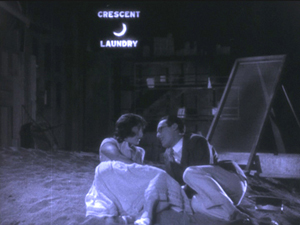 The romance provides one of my favorite comic intertitles, leading into a love scene: “During the days that passed, just what the man with a mansion told the miss with a mission–is nobody’s business.” The love scene in turn includes a visual joke that emphasizes the rich boy – poor girl contrast. Harold’s rich friends hear that the pair are to be married and determine to kidnap him to prevent the inappropriate match. 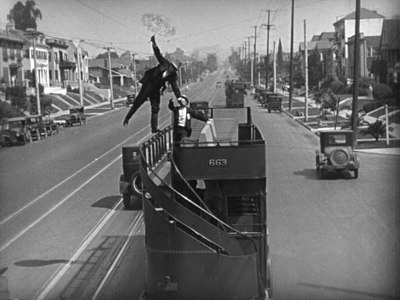 The result is a lengthy chase through the streets of Manhattan, with the drunken thugs rescuing Harold and using a variety of means to get him back to the mission in time for the wedding–as when the drunken leader of the group demonstrates his tightrope-walking abilities on the upper railing of a double-decker bus (see above). Two years ago, when I put Girl Shy on my list, the New Line Cinema boxed set of Lloyd films was out of print and hard to find, and the separate volumes appeared to be going out of print as well, with Volume 1 not being available at the time. The situation has changed, and the boxed set, though apparently still out of print, is now available at reasonable prices from various third-party sellers on Amazon and Barnes & Noble. The set contains a “bonus disc” with extras, including interviews and home movies. The same is true for the three individual volumes (here, here, and here). For Heaven’s Sake is in Volume 3. Inevitably, coming directly after Lady Windermere’s Fan, probably Ernst Lubitsch’s greatest silent film, So This Is Paris does not quite live up to its predecessor. Still, it’s a very fine, clever, and funny film, and it marks Lubitsch’s last appearance in these lists until sound arrives. The opening scene, running nearly twenty-five minutes, is as good as anything Lubitsch did in this era. Set in Paris, it’s a slow build-up of misunderstandings and deceptions involving two affluent couples in apartments across the street from each other. One couple, Maurice and Georgette Lalle, are practicing a melodramatic dance in Arabian costumes. Their marriage seems to be a rocky one. Across the street, Suzanne Giraud is reading one of the lurid “Sheik” novels that were popular at the time, involving “burning kisses” in its final scene. Put into a romantic mood by this, she looks out her window and sees the head of a man in a turban at the window opposite–Maurice relaxing after his strenuous rehearsal. Her husband Paul arrives home, and she kisses him passionately. Apparently not used to such affectionate greetings, he is puzzled until he, too, looks out the window. By now Maurice has doffed his turban and necklaces and appears to be not only naked but also examining a piece of his anatomy. Paul jumps to the conclusion that this sight is what caused Suzanne’s unaccustomed display of passion. 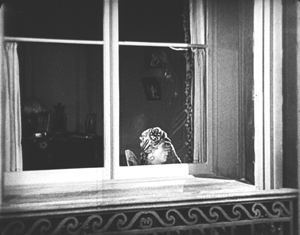 He calls her to the window, and we see Maurice in depth through the two windows. Suzanne then asks if Paul is going to stand for such a thing, and he goes to the other apartment to confront Maurice. Instead he finds Georgette, who turns out to be an ex-lover of his. She introduces him to Maurice, who is very friendly and charms Paul. The latter who returns home and claims that he has beaten Maurice and even broken his cane on him, though in fact he had simply forgotten it. Shortly thereafter Maurice visits Suzanne to return the undamaged cane and takes the occasion to flirt with her. It’s a beautifully plotted and developed farcical scene. The film is based on a French play and could easily have become stagey in its adapted form. 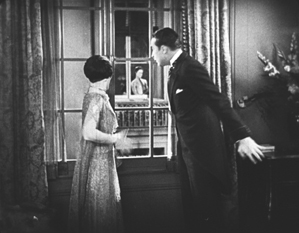 Yet the byplay between the two apartments via the windows allows Lubitsch to avoid any such impression; the misunderstandings based on optical POV recall the racetrack scene of Lady Windermere. The rest of the film develops the two potentially adulterous affairs, primarily with Paul secretly taking Georgette to the Artists’ Ball. 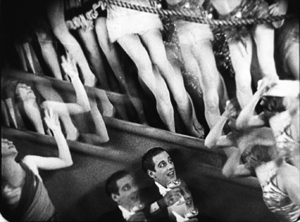 Here Lubitsch uses an elaborate montage sequence to convey the wild party, with superimpositions and shots taken through prismatic lenses. 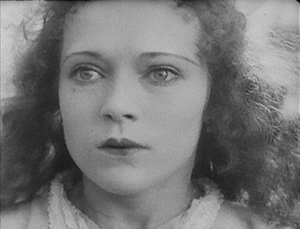 Such sequences were primarily developed in German films and were still fairly rare in American ones in 1926. Similar techniques convey Paul getting drunk on the champagne he and Georgette are awarded when they win a dance contest–the announcement of which on the radio broadcast of the ball alerts Suzanne to her husband’s presence there with another woman. So This Is Paris is less famous than Lubitsch’s earlier American comedies primarily because it has never appeared on DVD. Marilyn Ferdinand, in a blog entry that gives a detailed description of the film, writes that Warner Bros. claims not to own the rights to the film anymore and therefore has made no effort to bring it out on home video. 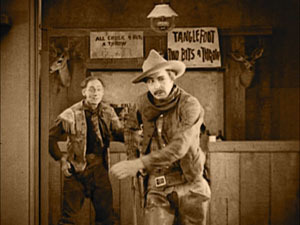 On the other hand, a four-minute excerpt of the dance montage sequence was included in the Unseen Cinema set (disc 3, number 18), and the credit there is “Courtesy: Warner Bros., Turner Entertainment Company.” Whatever the rights situation is, a home-video version of this film is in order. A beautiful 35mm print is owned by the Library of Congress, so there is hope. 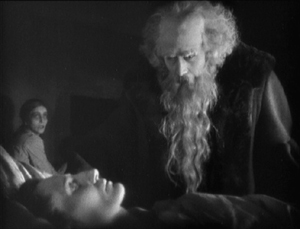 I must confess that I was disappointed the first time I saw F. W. Murnau’s Faust, and I have never warmed up to it in later viewings. I am delighted at having occasion to look at it again for this 1926 list, since a recently discovered and restored print reveals that the main problem before was the poor visual quality of the print formerly in circulation. Different local release prints survived in a number of countries, but there were basically two original versions made: the domestic negative for German release and the export negative. 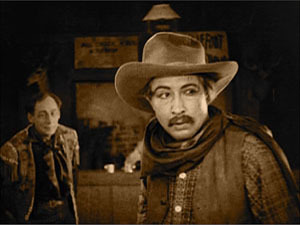 These were shot using two camera side-by-side on the set, as was the standard practice in much of the silent era, given the lack of an acceptable negative-duplicating stock. The primary camera contributed most of the shots to the domestic negative, though in some cases where the second camera yielded a superior take, that was used in the domestic negative. Conversely, inferior takes from the primary camera sometimes made their way into the export negative. The result, as we now know, was that both the visual quality and in many cases the editing of the scenes was markedly different in the two negatives. The version familiar for decades originated from the export negative. 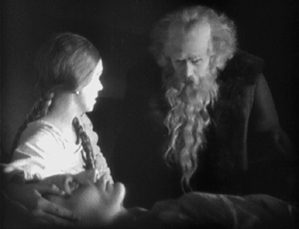 Recently the domestic negative was rediscovered, and the Friedrich Wilhelm Murnau Stiftung restored the that version using the that negative, supplemented with material from a variety of other prints. 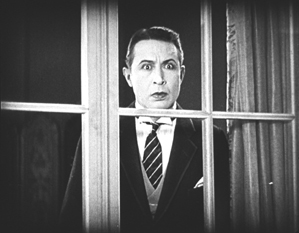 The result closely approaches the original German release version, including the original decorated intertitles. The contrast in quality between this restoration and the old, familiar Faust is remarkable. Given how dark the film is, details in the backgrounds could easily be lost. 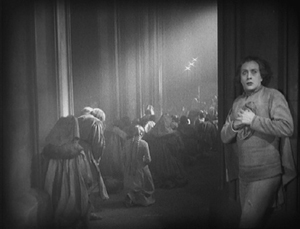 The scene in which Faust is called to help a woman dying of the plague is revealed to have dramatic staging in depth against a very dark room contrasted with the stark foreground underlighting of the woman’s haggard face. 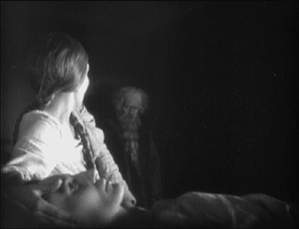 Faust enters from behind the daughter and comes forward to her, after which his movement is balanced by the daughter retreating into that same dark background. The famous aerial journey of Mephisto and Faust from Germany to Italy (below left) always looked rather hokey, but the detail revealed in the extraordinarily extensive model makes it far more impressive. Similarly, when one can actually see the sets, visual echoes become apparent. For example, Faust first encounters Gretchen and follows her into the church, where he finds himself barred from entering by his pact with Mephisto. Later, when Gretchen has been abandoned, she laments when not permitted to enter there. 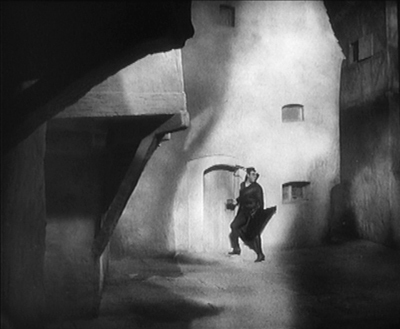 No doubt some motifs of this sort were visible in the earlier print, but their clarity here enhances both the beauty and the craft of Murnau’s film. 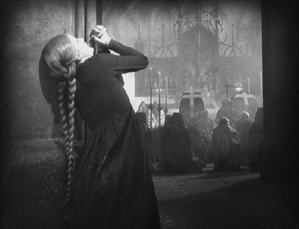 Faust is available in several editions on DVD and Blu-ray. 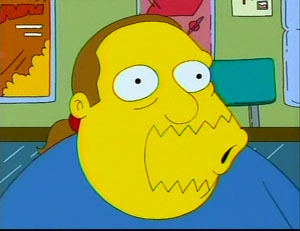 DVDBeaver ran a detailed comparison among seven of these, including a selection of frame grabs. To my eye, the 2006 DVD “Masters of Cinema” version of the domestic print, released by Eureka!, looked the best. (The two-disc set also includes the export version.) The Blu-ray from the same source, released in 2014, looked slightly darker. The box for the Blu-ray also includes the DVD, however. 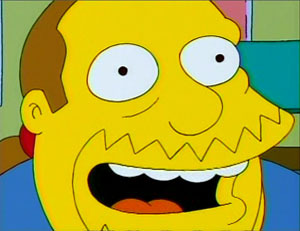 These releases are Region 2. The film is available on Blu-ray in the USA from Kino. Both Eureka! releases’ supplements include a booklet, a commentary track, a Tony Rayns interview, and a lengthy comparison of the domestic and export versions. 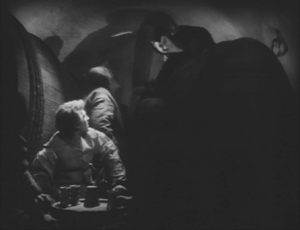 One particularly striking example is drawn from the scene in which Mephisto talks with Gretchen’s brother in a beer hall, with the domestic version on the left. While watching Faust, I kept grabbing frames, far too many to be used in this entry. They were simply too beautiful or impressive to be passed over, and they made my final selection of illustrations difficult. 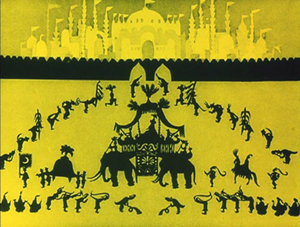 The only other film for which this was true this year is Lotte Reiniger’s silhouette-animated feature, The Adventures of Prince Achmed. The restored, tinted print that is currently available is even lovelier than the older black-and-white version. 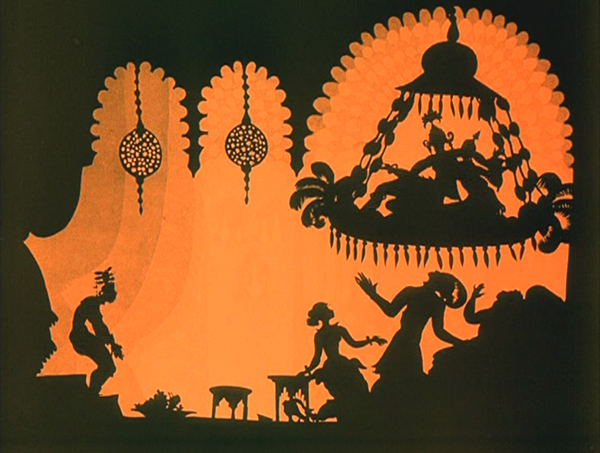 Reiniger seems to have invented the use of jointed silhouette puppets, and she still is the first artist one thinks of in relation to this form of animation. She continued to practice it until the 1970s. (See the link below to a collection of many of her short films.) Her one feature film remains her most famous and is probably her masterpiece. It involves far more than simple black figures moving against a light background. As the frame at the top of this entry shows, her characters, furnishings, and locations, all rendered in paper with scissors, were often elaborate indeed. Characters wore feathers, jewelry, fancy wigs, and other decorative elements. The hanging platform has many little tassels, and the lamps are rendered in delicate filigree. The backgrounds are not blank but have varying layers of saturation that suggest a depth effect, the equivalent of atmospheric perspective. At the left in the top image, a series of identical curtains start out a dusky orange and in three stages lighten until there is a bright, solid glow at the center. 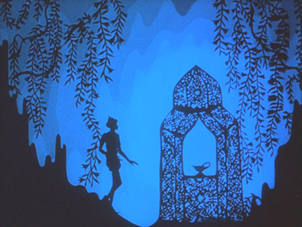 In the frame at the left below, the same sort of shading creates the depth of a cavern, setting off the tracery of the foliage and the kiosk in which the hero finds the magic lamp. On the right, very simple shading suggests a vast and elaborate palace in the background, while Reiniger fills the foreground with many small figures, all marching out to surround the procession of the caliph. A restored, tinted version of The Adventures of Princes Achmed is available from Milestone. A combination Blu-ray/DVD release of the film is available from the BFI. (I have not seen this version.) Note that these have somewhat different content. 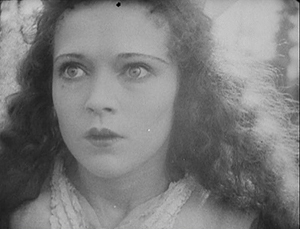 The BFI version has five Reiniger shorts from across her career along with a booklet. 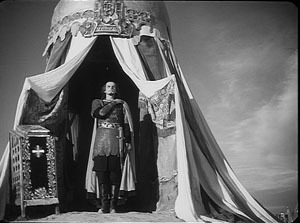 The Milestone version has only one of the shorts, but it includes a documentary about Reiniger. (This documentary was on the 2001 BFI release of the film on DVD but is not listed among the extras on its Blu-ray.) See also the BFI’s collection of many of her shorts, “Lotte Reiniger: The Fairy Tale Films,” which I discussed here. 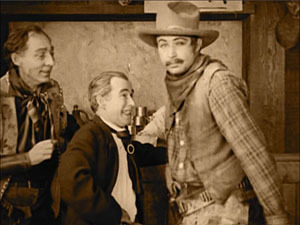 Few western viewers of 1926 saw any Japanese films, but Japanese audiences had been watching imported films for a long time. 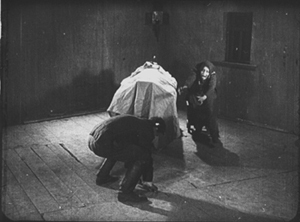 Hollywood films could easily be seen in the big cities, and The Cabinet of Dr. Caligari (released in 1922), La Roue (released in early 1926), and other films from Europe had made a strong impression on local filmmakers. One fruit of this influence was the wild Page of Madness (Kurutta ichipeiji, aka “A Crazy Page”). Directed by Kinugasa Teinosuke and based on a story by the renowned experimental writer Kawabata Yasunari, the film bore the influence of German Expressionist and particularly French Impressionist cinema. Page of Madness set out to be a bold exercise in subjective filmmaking. But it wasn’t widely seen at the time, and wasn’t revived until 1971, when Kinugasa discovered a print in his house (reportedly, among cans of rice). Apparently the version we have is slightly edited. A woman has been confined to a madhouse, and her husband has taken a job as a janitor there to stay in touch with her. 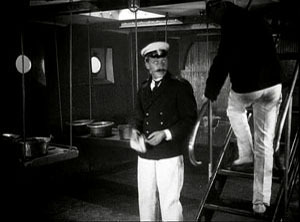 Many of the scenes are presented as the hallucinations of the wife and other inmates, while abrupt flashbacks attached to the husband fill in the past. But this story is terribly difficult to grasp. 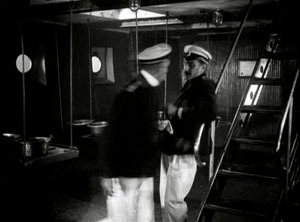 There are no intertitles (perhaps an influence of The Last Laugh, shown in Japan earlier in 1926), and the film is a blizzard of images, choppily cut or dissolving away almost subliminally. 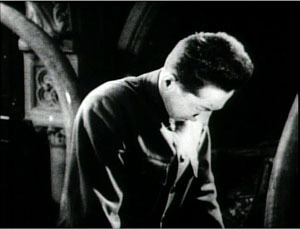 Viewers of the period had the advantage of a synopsis printed in the program, and there was a benshi commentator accompanying the screening to explain the action. Because we lack those aids, the film seems more cryptic than it did at the time. Even when you know the story, though, Page of Madness often surpasses its foreign counterparts in its free, unsignalled jumps from mind to mind and time to time. 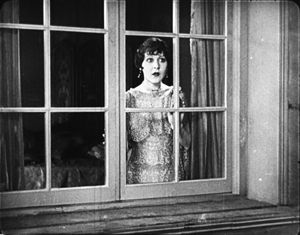 It remains a powerful example of narrative and stylistic experiment, from its canted framings and single-frame cutting to its frenzied camera movements and abstract planes of depth (thanks to scrims à la Foolish Wives, 1922). 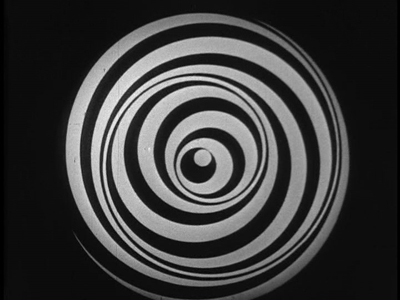 For nearly fifty years it has remained a milestone, a grab-bag of advanced techniques and likely the closest Japan came to a silent avant-garde film. Page of Madness is not commercially available on home video. It is occasionally shown on TCM, and a reasonably good print is on YouTube. Aaron Gerow’s A Page of Madness: Cinema and Modernity in 1920s Japan is an indispensable guide to Kinugasa’s eccentric masterpiece. In connection with our textbook, Film Art: An Introduction, we’ve created several videos examining film techniques. 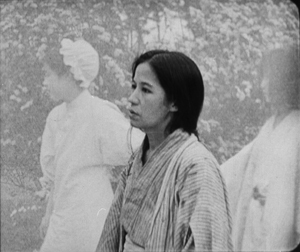 Thanks to Peter Becker and Kim Hendricksen of Criterion Classics and Janus Films, we’ve been able to include clips from film classics, from Ashes and Diamonds to Ugetsu Monogatari. Because our publisher McGraw-Hill sponsored the production of these pieces, most of them are on a dedicated website called Connect, accessible only to students and teachers using the book in courses. We’ve made one video freely available on Criterion’s own site, where Kristin discusses some editing techniques in Agnès Varda’s Vagabond. 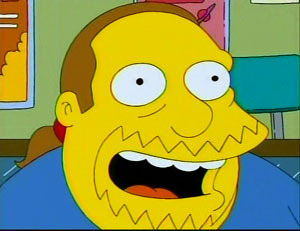 But not everybody who reads Film Art is in a course using the online supplements. And some people who aren’t reading Film Art might still enjoy learning more about the topics we cover. Moreover, we’ve had such good response to the Connnect clips that we decided to create a longer, more wide-ranging piece, also suitable for classrooms. So we prepared another video and today are making it available to anyone. The Connect pieces mostly concentrate on single scenes, whereas this one roams across several films before focusing on a single example. Specifically, we look at the technique of constructive editing, which we discuss in Chapter 6 of FA. 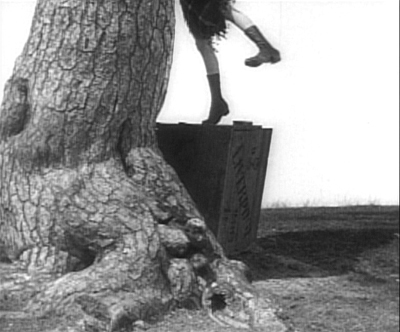 The video draws examples from silent films including Harold Lloyd’s Number, Please? (1920) and Lev Kuleshov‘s Engineer Prite’s Project (1918), while our more recent examples include The Social Network and The Ghost Writer. 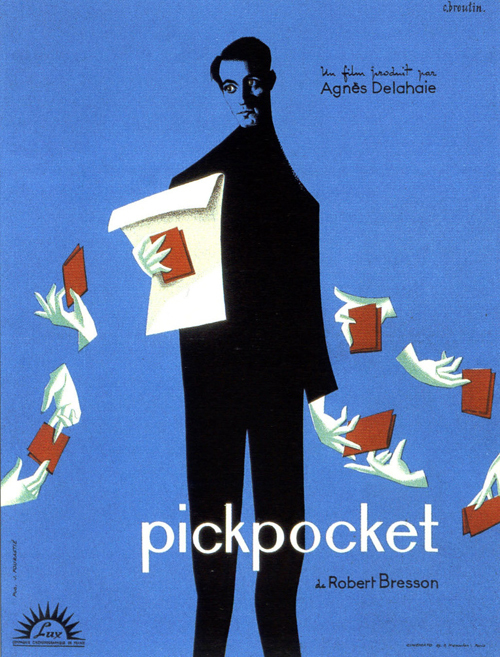 Thanks again to Criterion, the extract we focus on comes from Bresson’s brilliant Pickpocket (1959). This piece is produced by Erik Gunneson, a local filmmaker who did an excellent job on the Connect materials. I wrote the script and narrated. (A cold I couldn’t shake off betrays itself in my voice.) We did the work in our production facility here at the University of Wisconsin–Madison Department of Communication Arts. The links flagged above indicate blogs that are related to this new video. 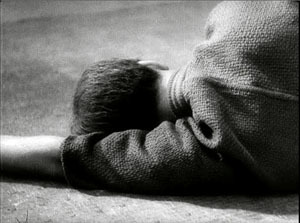 Some others are “What happens between shots happens between your ears” and “The Movie looks back at us” and “They’re looking for us.” There’s also “Three nights of a dreamer,” discussing a passage in In the City of Sylvia that may be a slantwise homage to Bresson’s editing technique. Just to be clear: The twelve-minute video is available to anyone who’s interested. You can watch it below or on Vimeo. Erik, Kristin, and I hope you enjoy it. 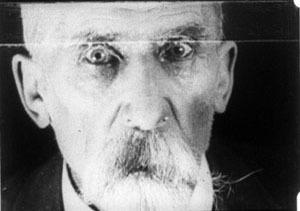 PS 4 November 2012: Our discussion of the Kuleshov effect has led some to ask us whether the several videos on YouTube are authentic footage of Kuleshov’s experiments. Alas, they are not, but Kristin and I don’t know their provenance. However, in Oksana Bulgakowa’s documentary on the Kuleshov effect, available on YouTube, there are some fragments of the surviving footage, starting at 4:28. Oksana has also helped complete the experiment by inserting a substitute for a missing shot. In addition, I’m reminded by Joe McBride and Katharine Spring of Hitchcock’s famous explanation of the Kuleshov effect, available on the DVD, A Talk with Hitchcock. An excerpt from that is posted on YouTube, probably illegally. Abbas Kiarostami has the widest octave range of any filmmaker I know. His humane dramas of Iranian life, from The Traveller to The Wind Will Carry Us, have justly won acclaim on the arthouse circuit. He has written scripts as well, some—like the under-seen The Journey (1994)—that are as compelling as a psychological thriller. He can conjure suspense out of the simplest acts, such as whether an adult will rip up a child’s copybook (Where Is the Friend’s Home?) or whether a four-year-old boy locked in with his baby brother can figure out how to turn off a stove (The Key). Indeed, I think that one of the great accomplishments of much modern Iranian cinema, with Kiarostomi in the vanguard, has been to reintroduce classic dramatic suspense into arthouse moviemaking. 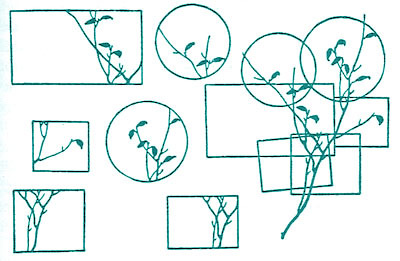 But at times Kiarostami has moved to an opposite pole, that of extreme minimalism and “dedramatization.” The drift toward a hard-edged structure was there in Ten (2002), which gave us one of his drive-through dramas—people conversing in the front seat of a car—but in severe permutational form (different drivers, different passengers). Rigor was pushed to an extreme in Five Dedicated to Ozu (2003): Five lengthy shots of water landscapes, each many minutes long, taken at different times of day. The biggest dramatic action was the ducks walking through the frame. With Kiarostami, it seems, we cinephiles can have it all—Hitchcock and James Benning in the same filmmaker. Now Shirin (aka My Sweet Shirin, 2008) marks another highly original exploration. I don’t expect to see a better film for quite some time. That’s it. 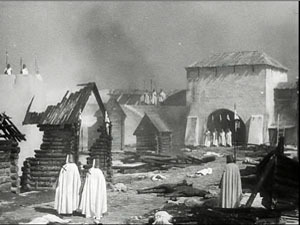 The closest analogy is probably to the celebrated sequence in Vivre sa vie, in which the prostitute played by Anna Karina weeps while watching La Passion de Jeanne d’Arc. 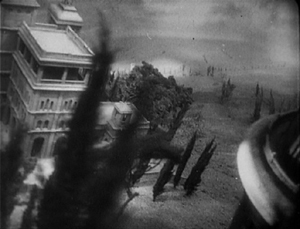 Come to think of it, the really close analogy is Dreyer’s film itself, which almost never presents Jeanne and her judges in the same shot, locking her into a suffocating zone of her own. Of course things aren’t as simple as I’ve suggested. For one thing, what is the nature of this spectacle? Is it a play? The thunderous sound effects, sweeping score, and close miking of the actors don’t suggest a theatrical production. So is it a film? True, some light spatters on the edge of the women’s chadors, as if from a projector behind them, but no light seems to be reflected from the screen. In any case, what’s the source of the occasional dripping water we hear from the right sound channel? The tale is derealized but it remains as vivid on the soundtrack as the faces are on the image track. What the women watch is, it seems, a composite, neither theatrical nor cinematic—a heightened idea of an audiovisual spectacle. Moreover, there are the faces. We see some more than once, but new ones are introduced throughout. Spatially, they float pretty free; only occasionally do we get a sense of where the women are sitting in relation to one another. All are stunningly beautiful, whether young or old. We get an encyclopedia of expressions—neutral, alert, concentrated, bemused, amused, pained, anxious. 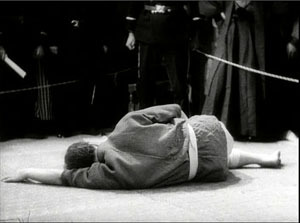 During a battle scene, faces turn away, eyes lower, and hands shift nervously. The best person to review this movie is probably Paul Ekman, world expert on the nuances of facial signaling. I once asked Kiarostami how he got the remarkable performances in shot/ reverse-shot that we see in films like Through the Olive Trees and The Taste of Cherry. He said that he simply filmed one actor saying all his lines and giving all his reactions, then filmed the other. Often the two actors were never present at the same time, especially when he shot the car sequences. This montage-based approach, creating a synthetic space simply by cutting, has been taken to an extreme in Shirin, where the soundtrack supplies the reverse shot we never see. We’re told that Kiarostami filmed his female actors here reacting to dots on a board above the camera! Indeed, Kiarostami claims he decided on the Shirin story after filming the faces. Despite that, Shirin becomes one of the great ensemble pieces of screen acting, although the actors almost never share a real time and space. (Take that, green-screen wizards!) Like Godard, Kiarostami has been busy reinventing the Kuleshov effect (perhaps by way of Bresson). One last note: Kiarostami built movie production into the plot of Through the Olive Trees. Now he has given us the first fiction film I know about the reception of a movie, or at least a heightened idea of a movie. What we see, in all these concerned, fascinated faces and hands that flutter to the face, is what we spectators look like—from the point of view of a film. For more on the production background, see the lengthy interview with Kiarostami here.